Ideal for storing all washing up accessories in a single place. With two retractable rails for hanging up damp dishcloths and sponges. Tidy-tex can be configured in different ways, in order to suit the most convenient place to be set. The Milwaukee Jobsite organizer is the most versatile of its kind and was designed for increased productivity and up to 20% more capacity than the competition. Designed with the needs of the professional tradesman in mind, the new organizer includes (8) small and (2) large bins that can be mounted on common jobsite materials by utilizing the integrated screw slots. A no travel seal around the perimeter of each bin prevents small items from migrating from one bin to the other, and the convenient 4x4 size of the small bins allows them to be easily swapped out with a common electrical box. To allow users the option of carrying multiple organizers at once, the Milwaukee 20 Jobsite Organizer contains innovative side clips, that not only allow the units to be attached together, but provide full access to each when they are stacked on top of one another. For added durability, the new unit features a reinforced rib for strength and an integrated weather seal gasket to prevent water intrusion. This Stack-On Deluxe Plastic Deep Cup Storage Organizer is a heavy duty organizer that can stand up to daily use. It is also customizable with removable cups. Use it to organize small parts in the garage, shop, inside the home or on the go. The lid securely latches so all your contents stay in place. This organizer has 10 removable cups in 2 different sizes. The ToughBuilt Wall Organizer transforms the way professionals organize their tools and supplies. Solidly mounts on the wall on in the back of a van with included screws and wall anchors. This organizer is designed to work with all ClipTech pouches. It gives the professional a quick clip-on, clip-off way to systematically arrange their tools on the wall, and quickly grab the pouch and tools you need for the job at hand. It provides superior visibility and accessibility. Constructed of durable powder-coated steel, multiple Wall Organizers can be combined to organize complete tool collections. ClipTech Hubs sold separately. 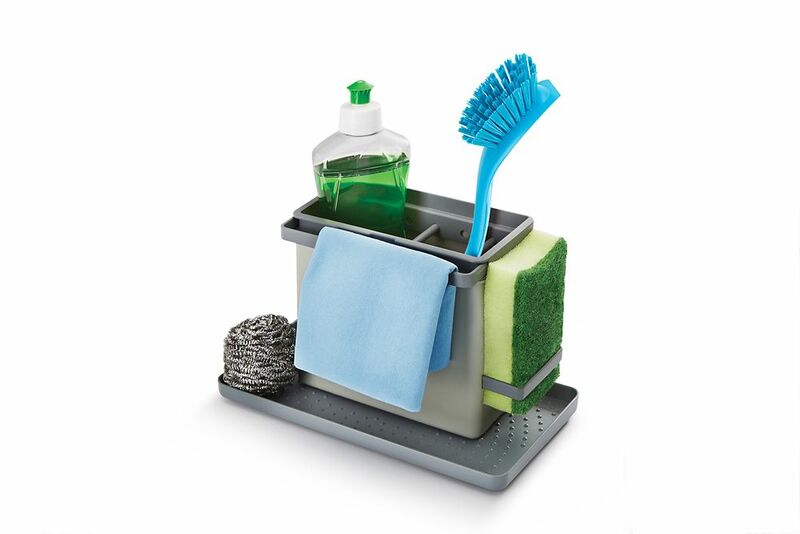 Tidy Tex Sink Organizer Counseltron series of professional kitchen gadgets and housewares. For professional chefs. The ultimate collection of main kitchen tools such as ladles, spoons, turners and skimmers; essential gadgets like peelers, can openers, corkscrews and graters to sophisticated utensils like tea spoons and serving sets. A complete assortment for every need at the table and in the kitchen. Tidy Tex Sink Organizer is rated 1.0 out of 5 by 1. Rated 1 out of 5 by Sylrob0304 from Very disappointing, not functional I purchased this for our newly renovated kitchen to hold one bottle of dish soap, scrubber and a sponge. This caddy is so small it will not fit a normal size dish detergent bottle nor would it fit a small bottle; I tried that too. The bottle it shows in the picture must be the miniature size. I just gave it to our cockatoo as a toy she can destroy. Please don’t waste your money.